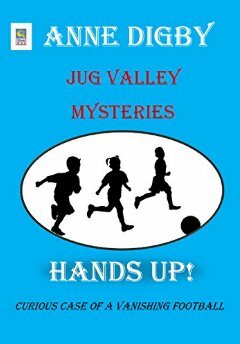 Jug Valley Mysteries, HANDS UP! Amy and Tim are students at Jug Valley. Together with their friends and fellow students, Ben, Ludo, and Mini, they have formed a club called Hands and Spouts. They meet regularly to solve mystery cases. One day at school, Ben accidentally kicks a football over the fence into the rector’s garden. It belongs to Charlie, a lower class man, who becomes terribly distraught. The five friends make a promise to retrieve the precious football as soon as the school day ends. What appears to be a simple task turns thorny, when the members of the club discover the football has vanished into thin air. Howard, the rector’s son, promises to help, but the trail runs cold. These young detectives are mystified as to why a grungy, old football is so important, but when it becomes apparent that football is gone, they intensify their efforts to stop at nothing to get Charlie’s football back into his hands. Why is this football so valuable and why are so many people trying to gain possession of it? There are enough twists and turns to entice middle grade readers to keep turning pages. When the mystery is finally solved, all who have been touched by it learn valuable lessons about themselves and each other. My only criticism is that the story begins slowly. I had not read any of the other books in the series and therefore was unfamiliar with the characters. After the first couple of chapters, the story evolved and grew more interesting. I like the fact that there is enough challenging vocabulary to stretch the minds of young readers. American readers will need to acclimate to British phrases. Recommended especially for readers in the eight to twelve age bracket.